Steam is the most popular way to download games on Windows PC. No matter the game, you can find almost all the games on Steam. The best thing about Steam is that it makes downloading, installing, and managing games a pain-free experience. Just select the game you want to download and Steam does all the work. The thing I really like about Steam is that it downloads games very fast. Most of the time, Steam will max out most home users internet bandwidth. For instance, I have a 20 Mbps connection and Steam uses all of it no problem. If the games are small then Steam using all the bandwidth may not be a big issue. But today's games are huge, we are talking about a few 10s of gigabytes. In those situations, Steam using all the available bandwidth can really hamper your daily browsing and other internet activities. To avoid that, you can simply limit Steam download speed so that you will have spare bandwidth to browse the internet while Steam is downloading your favorite game in the background. Simply put, you get best of both worlds. Let me show you how to limit Steam download speed. Limiting download speed in Steam is far easier than you think. Previously, you needed to edit Steam config files to limit the download speed. But, that's no longer the case. 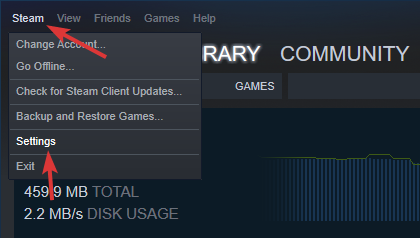 The modern version of Steam client has built-in options to limit the download speed. However, the option is buried deep within the settings app. Moreover, due to the dark user interface and small letters, it can be a bit harder to find for some users. But, follow the below steps and you should be good. 1. First, if you haven't already, launch Steam by searching for it in the start menu. 2. In the Steam client, go to "Steam > Settings." This will open the Steam settings window. 3. In the Settings window, go to "Downloads" appearing in the left panel. This is where you can limit Steam download speed. 4. 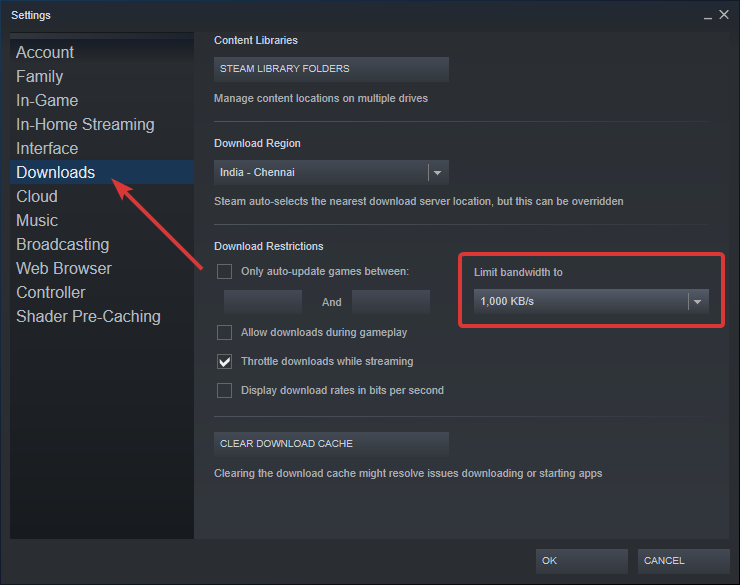 On the right panel, under the "Limit bandwidth to", select the speed you want Steam to be limited to. For instance, I want Steam to only use 10 Mbps of my 20 Mbps connection. So, I've selected 1,000 KB/s from the drop-down menu. Click on the "Ok" button to save changes. Note: All most all internet service providers (ISPs) tell you their speed either in Kbps (Kilobits per second) or Mbps (Megabits per second). To find real download and upload speeds, you need to divide your internet speed by 8. For example, if you have a 20 Mbps connection like me then the effective download speed you get from your internet service provider is 20/8 = 2.5 Megabytes per second (MBps). The same example is applicable even if your speed is designated in Kbps. When divided, you will get effective speed in KBps. That is all. 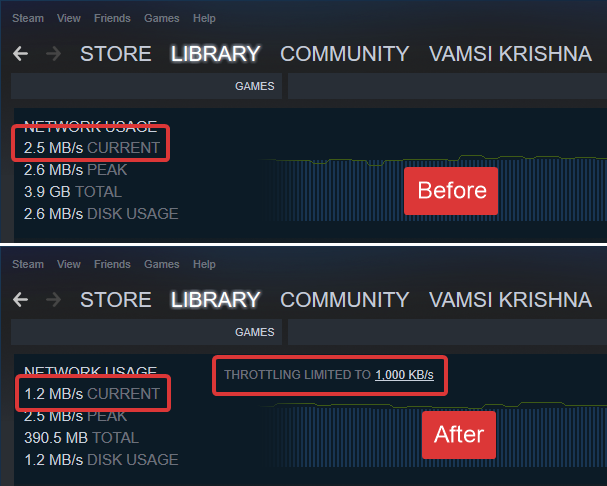 As soon as you save the changes, Steam will limit the download speed to match your settings. Since I chose to limit Steam to 10 Mbps, the effective download speed is 1MB per second and I have the additional bandwidth of 10 Mbps for other internet activities like browsing and streming. If you want Steam to download at full speed again, simply select "No limit" in step 4 and save changes. This removes any bandwidth limitations. Hope that helps. Comment below sharing your thoughts and experiences about using the above method to limit Steam download speed.